Chalfont hearing centre is the premier hearing clinic in Little Chalfont Buckinghamshire. Leon Cox the lead audiologist is fully qualified to conduct hearing tests, dispense hearing aids and remove ear wax using Micro-Suction. If you are suffering with Tinnitus Leon can discuss Tinnitus therapy to reduce the Tinnitus. Please ask reception or ask Leon at your next appointment. Tinnitus can be managed. Hearing tests are always available at the Chalfont Hearing Centre, please call for an appointment. With today’s start of the European Union of Hearing Aid Acousticians(EUHA) Congress in Hannover, Germany, GN ReSound has announced a new partnership with Google that will provide a full spectrum of direct streaming to hearing aids from Android devices, and the company is showcasing what the company is calling a “premium-plus” hearing aid, ReSound LiNX Quattro,™ which was previously launched in August. 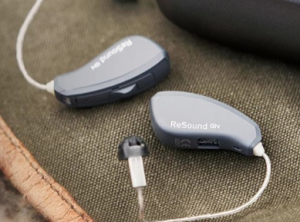 According to ReSound, the LiNX Quattro offers “a brilliant sound experience with unprecedented Layers of Sound.” In a direct comparison, where hearing aid users were asked to listen to music and rate the sound, the company states that 95% of respondents preferred ReSound LiNX Quattro compared to other premium hearing aids. A new high-performing chip platform drives the extensive sound quality improvements, providing 100% faster processing, twice the memory capacity, and 35% increase in frequency bandwidth compared to ReSound LiNX 3D™. With a bandwidth of up to 9.5 kHz, a greater range of high-frequency sounds is accessible to people with hearing loss. An input dynamic range of 116 dB SPL—reportedly the highest in the industry—is designed to ensure that softer sounds are clearer and louder sounds are distortion free. GN Hearing’s recently-announced partnership with Google allows it to offer a full spectrum of direct streaming from Android devices to hearing aids. It continues GN Hearing’s record of industry breakthroughs, including 2.4 GHz wireless connectivity, Binaural Directionality, direct full streaming compatibility with Apple devices, and cloud based remote fine-tuning. GN Hearing has also recently launched Beltone Amaze™, which GN characterizes as the world’s most complete hearing solution that combines great sound quality, connectivity, rechargeability and remote fine-tuning. The company also recently introduced Interton Ready™, which is designed to offer great sound, ease-of-use, and connectivity at an affordable price.